How do you recover deleted contacts from Android phone? Find out the phone number that you have written down beforehand and then type in it into your mobile phone one by one? Just discard this way and now you can complete the Android contacts recovery more easily. Just read on to get them! Accidentally deleting the phone number on Android is normal in our lives - sometimes even an accidental click can cause this issue. And when you incautiously lose the phone number of your friend or co-worker, you must want to recover the deleted contacts from your Android, right? Then you should stop using your phone and restore the lost data as soon as possible. Otherwise, your lost contacts will be covered. How to Recover Deleted Text Messages from Android Phone Easily? How to Recover Data from Broken/Damaged Android Phone? #2 How to Restore Android Contacts with Gmail? Probably Your Contacts Are Not Deleted, Let's Check It! Before finding ways to restore or find back your phone number, you'd better have a look at your Android device. That's because your contacts might not be deleted. So you need to make sure all your contacts are being displayed. Step 1. Unlock your Android. Then find out and open the "Contacts" App. Step 2. Tap on the "menu" button on the top right corner and then choose "Settings" > "Contacts to Display". Step 3. Select "All Contacts". After that, you can return and check whether you got the lost contacts back or not. If it is back, that means your contacts is not deleted but hidden. But if it is still not back, you can try the following methods to restore them. For iPhone users, you can read another page to learn how to recover deleted contacts from iPhone devices. 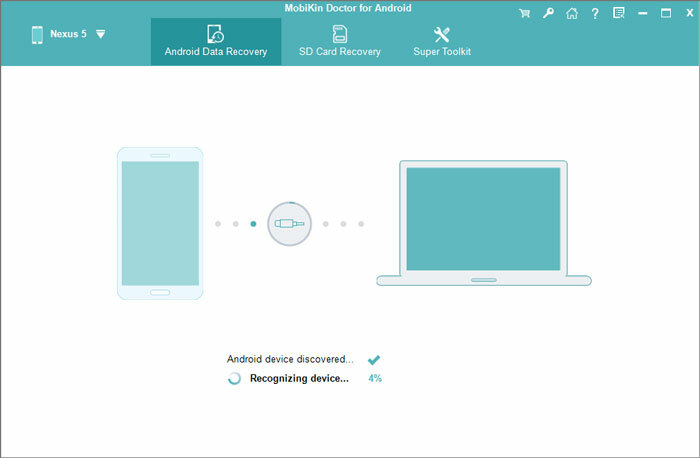 An excellent Android contacts recovery program is required for the task - MobiKin Doctor for Android (Win/Mac). This tool is easy to manage as you can retrieve lost or deleted contacts from phone memory or SIM card through only several clicks. Furthermore, before you make the recovery, the program allows you to preview all the missing or deleted contacts information from the phone memory, including name, phone number, email address, company address and so on. Hence, you can choose what you want and recover them selectively. What's more, the restored contacts can be saved in the format of HTML. With this program, you are able to recover deleted contacts from SIM card as well. Download and install the program on your computer, then run it. Next, connect your Android smartphone with your computer through a USB cable, and then open the USB debugging on your device if required. If you don't know how to do it, you can go to learn the detailed steps on enabling USB debugging on Android devices. After the connection, you need to check the "Contacts" option and click "Next" on the primary interface. After that, the program will start scanning your entire contacts list from your phone memory, including the lost and existing number and showing them in the program. If you just want to view the deleted contacts, you can toggle on the button "Only display the deleted item(s)". Then you can click the "Contacts" button in the left panel for a preview of each telephone number and contact name, address, email address, company name and other contact information. Now you can select what you want to recover and export them to your computer by clicking on the button "Recover". When the recovery process ends, you can turn on the folder that you used to save the restored contacts just now to check the deleted contacts. How to Restore Android Contacts from Gmail? Step 1. Go to Google Contacts and login to your Google accout. After that, you can click on "More" and choose "Restore contacts...". Step 2. Then you will get the following popup in which you can restore your contacts list back to any state in the past 30 days. Step 3. Select the backups you wish to restore, then click "Restore" button to begin the process. Step 4. When the restoring process finishes, you should go on to re-sync the Google account on your Android. GT Recovery is a free but powerful recovery tool for Android devices. It can recover your lost files securely and quickly, including contacts, text messages, images, files, Facebook Messenger history, WhatsApp history, call logs and so on. And apart from recovery, it allows you to erase the needless files from Android. All in all, with this application, you can restore the deleted contacts easily. Undelete Master is another option for you. This application enables you to retrieve different kinds of files like contacts, SMS, documents, photos, Wi-Fi password, etc. with ease. And before the recovery, you are able to preview the contents. From its name, you can know that Deleted Contacts Recovery is a tool designed for recovering deleted contacts. With it, you can recover your lost contacts even after a factory reset or from another phone you sold. Backup Android Contacts to Avoid Losing Data Again! To keep your Android contacts safe, you'd better keep a backup of them. And here, saving your Android phone contacts on computer with the help of MobiKin Assistant for Android could be a good choice. By using it, you can copy complete information of your Android contacts to computer, including names, numbers, emails, job title and so on. Apart from contacts, it also enables you to transfer SMS, photos, videos, music and apps from Android to computer. If you are interested in it, you can click the blue icon below to get the program and then use it to transfer your contacts from Android phone to computer for backup. Well, above are the whole contents of recovering lost contacts on Android devices. Do you get some ideas about how to do it next? 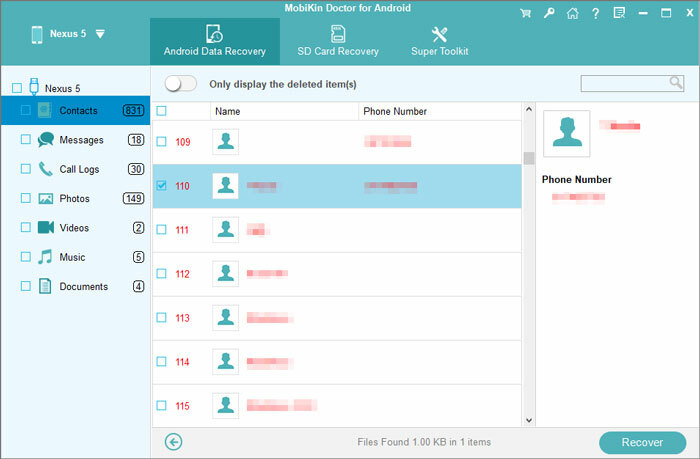 Generally speaking, MobiKin Doctor for Android could be the best tool to solve your Android data losing problems on Windows or Mac. So If you're interested in it, don't hesitate to download it and use it to retrieve your contacts with 3 steps! And also, if you have any idea about this tutorial, please feel free to share with us! How to Access & View Android Text Messages? How to Recover Deleted Text Messages from Samsung Galaxy? How to Recover Deleted Pictures/Photos from Android? How to Recover Deleted Photos from HTC Phone? How to Recover Deleted SMS (Text Messages) from LG Optimus, Cosmos, Rumor, etc.